Several years ago I was burnt out from years of business travel, long meetings, sales reports, and corporate America. I guess I was teetering on the edge of a midlife crisis. Luckily (for my wife), I found WRIR and, thus, the opportunity to host a radio show. My show takes its name from the book written by Sloan Wilson. The novel is “about the search for purpose in a world dominated by business.” In the novel the main characters “share a struggle to find contentment in their hectic and material culture”. I guess you could say my show is my own personal search – through music – in the middle of the night every Monday. 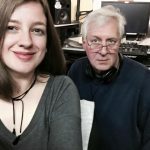 So join me and I’ll bring you an out-of-the-ordinary mix of blues, soul, rock, funk, Americana, bluegrass and whatever else it takes to shake the work blues. Oh and the name, the Haberdasher – well, that’s a story for another day. So tune in.